The theme of Material Web Design style is not new, especially to industry professionals, so we are not going to dig into details here. We can say that the article is sooner aimed on encouraging creative artists to continue their experiments with the trend and showing some nice examples developed in Material style. As you remember, material design was invented by Google. Its code name is “quantum paper”. The name itself prompts that the design concept is based on how real material responds to human touch. It’s a well-known fact that the trend was inspired by the study of paper and ink, yet technologically advanced and open to imagination and magic. Material Design uses grid-based layouts, responsive animations and transitions, padding, and depth effects such as lighting and shadows. Material has physical surfaces and edges. Seams and shadows provide meaning about what you can touch. Material Design has two approaches for layouts and motion; paper being for former and ink being for the latter. The material environment is a 3D space, which means that all objects have x, y, and z dimensions. The z-axis is perpendicularly aligned to the plane of the display, with the positive z-axis extending towards the viewer. This ‘z’ parameter is what provides the feel of depth to any object in a layout. UI designers often say that Material Design is a subtle skeuomorphism yet flat, packed with intelligent touch feedbacks and transitions. It’s our strong belief that Google has done a beautiful job by incorporating material response with motion. Touch responses are inspired by how ink spreads on paper. The responsive animations and transitions are really amazing and intuitive. You will be able to view the live demos of the themes featured here and see what we are talking about with your own eyes. Actually there are many of them, but we will list only the ones we consider outstanding. You can comment on our list or continue it at the comment section. The depth of material along z-axis makes it awesome. The transitions and animations lead to self-explanatory changes that users can easily understand. Laws of real world with physics involved in it. An element entering should enter with the peak velocity, and should move with constant velocity. FAB – Floating Action Button. Color Palette and imparting a brand identity to your applications. Use of polymer for universal design. Roboto – a typeface developed specifically for digital screens, which was never done before. It looks good on both small and big screens. Cards – although this was available before too, but the Cardview is clutter free information, even in the shakiest moments. No disconnection between pages. Pages used to have a very disconnected feel while moving from one to another. Now, they got an essentially more connected look. Would you like to know what do users like about material design? Read on, we guess it’s useful. Some of them like Google’s explanation and codification of material world. Of course we have got used to virtual worlds, and virtual buttons, controls, and objects no longer have to look like things that exist in the physical world. But material style objects are balancing somewhere in between, they look current, yet it is still easy to understand how to interact with them. By creating a new standard, where we are designing primarily for Flatland, we are freed from the constraints and the data bulkiness of trying to make things look like things in our world. That’s Google Material. It’s a system that explains this concept of design, which sets out rules that embrace this form of design, so that it’s sleek, code efficient, and contains a small data footprint so that it can be deployed on any and all devices in the most data friendly way possible. Why should a button on your smart phone look like a button in the physical world that has a height as well as a width and length? A flat width and length with a distance above a plane for shadows is sufficient to cue the users that they are supposed to push something; and to give them visual feedback, either with a shadow change or color change, that they have effected a change of state. The things that users like the most are the transitions and animations, which have the potential to reduce the disconnection between their movements between two different pages in an application. They also feel good about the way in which information is being presented to the user in material design. Everything is clutter free and contextual. And what do you like in Material Design? You feedback is welcome at the comment section. Want to see some great examples of Material Design? Here they are. 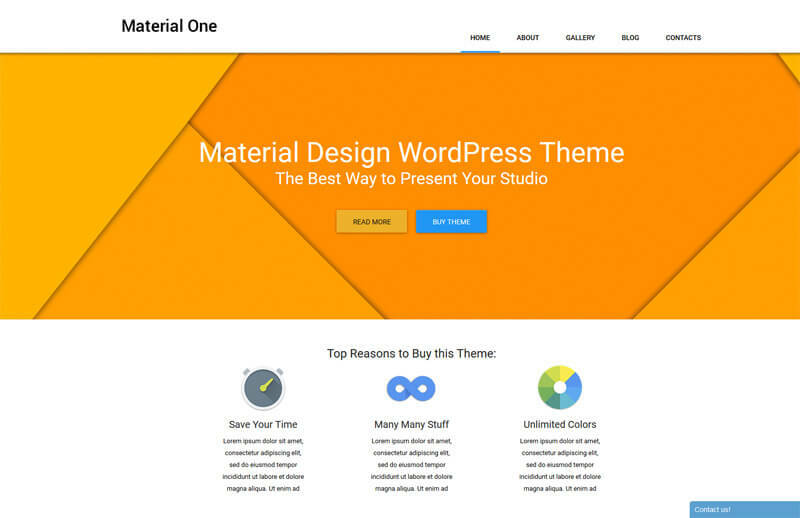 5 WordPress themes developed in accordance with material style rules and guidelines. By the way, you can use them for your own projects, demo and download links are provided under the screenshots. 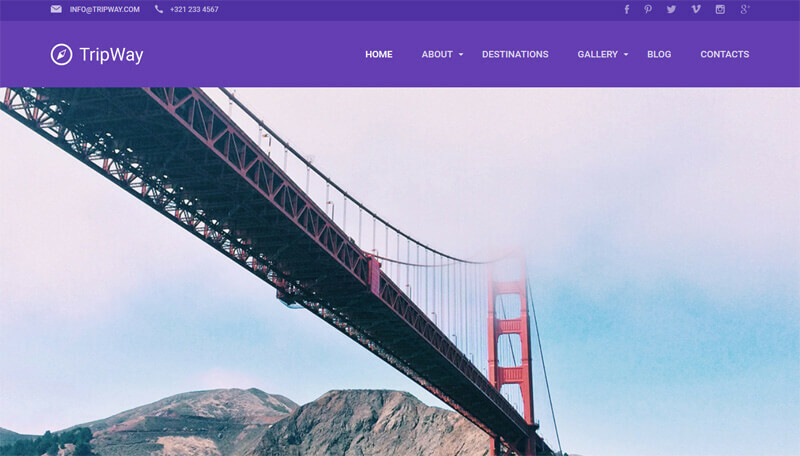 This theme will help you tell your own story on the web. Apart from its visual appeal, Presentation theme is packed with multiple features like Admin Panel, Bootstrap, Cherry Framework, On-line chat, Responsive, WPML ready and MotoPress Slider. HTML plus JS, Parallax and Lazy Load effect animation makes it even more interesting to view. Integrated Audio and Video Player will make your presentation simply unforgettable. Use this theme for your blog or portfolio. Choose between Accordion, Carousel, Isotope, and Slider gallery scripts to impress your visitors. Parallax effect will submerge them deeper into your virtual environments. Search engine optimization will make your website easy to find on the web. 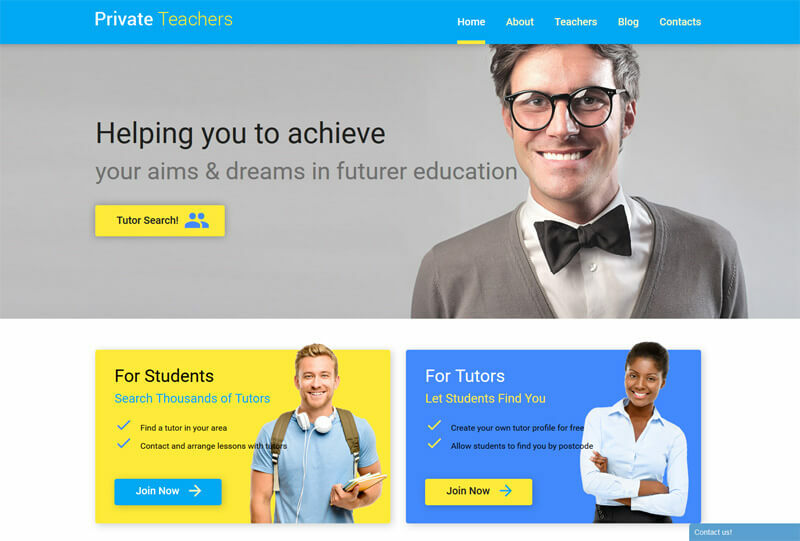 Education websites can also be material. Trendy layouts always grab users’ attention. Especially when they are supplied with cool animated effects, sliders, audio and video integration, and many other current features. The author has chosen the right style for a travel agency presentation. Bright colors, nice images transitions, custom post types, tabs, tooltips and so on make the layout of this website one of a kind. The theme is well documented, so customization won’t be an issue either. This theme is rather universal, so you can do almost anything you want out of it. It utilizes the power of Cherry Framework and Bootstrap which makes all your manipulations with the theme quicker and easier. It is responsive and crossbrowser compatible, so your visitors will be able to enter the website from any gadget they have at hand. It’s time to roll up. We hope you found at least a few tidbits in our blog post. Summing up everything said above and before, we would like to stress that the author of this article doesn’t share the opinion that Material = Skeuomorphic = Flat design. Material design is also not a kind of skeuomorphism and flat design mixture. The trend can be considered separate and independent. Eventually, web design has its history and milestones; it’s a natural process of development. The trends change each other, affect each other, and sometimes this gives striking results. So, be up to date, go material or flat or invent your own, better style, and don’t get confused with the terms. Cheers! I used Material Design for my website MegaTheme.ir and after that my sales increased.